NICK CARDY Pencils and Inks. 11" X 16.5" in good condition. The Logo is a recent replacement. This is the original "one of a kind" art used to make the comic book. 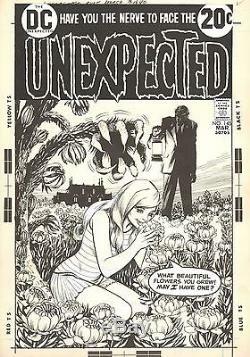 The item "NICK CARDY The UNEXPECTED #145 DC Original Comic Book Bronze Art 1973 COVER" is in sale since Thursday, October 13, 2016. This item is in the category "Collectibles\Comics\Original Comic Art\Interior Pages". The seller is "make_mine_marvel_1973" and is located in New York, New York. This item can be shipped worldwide.